NOTE: This page is under construction but fairly complete. Greetings friends! This guide will help you get started on Goatlings.com! You can visit this page anytime by clicking the New Bee Guide link at the bottom of each page. A few quick basics you'll need to know right away. Currency - There are 3 types of currency on Goatlings.com. Sugar Stars - The most common type of currency. Used for almost everything that require a fee. Can be found in many way around the site. Diamond Dust - Can be bought with real money (Via Paypal) Used to buy special items in the Diamond Dust shop. Goat Tokens - Obtained through a number of ways, used for the Token Game in the Arcade. Item Types - Each type of item has a purpose or action. Food - Raises your Goatlings hunger. Toy - Raises your Goatlings mood. Battle Attack - Attack items for your Goaltings to use in battles. Battle Defense - Defense items for your Goaltings to use in battles. 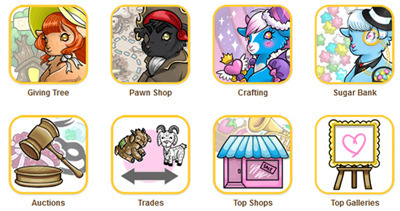 Collectible - For Profile Collections, Gallerys, or Pet Treasure. Books - Raises your Goatlings intelligence. User Icon or Display Name Icon - A animated pixel decoration for your username. Appearance Doll or AD - Changes your Goatlings look. Health Potion - Recovers your Goatlings health points. Retired - No longer in production. Lucky Boxes - Items that can be 'opened' to receive a randomized prize. Support Tickets If you have questions or need to report something you can reach Goatlings Staff by sending a Support Ticket. To start things off, lets get you your first Goatling! Head to the Adoption Center by clicking "Adopt" in the left navigation menu. You will see three options; Rehome, Adopt, and Surrender. Lets focus on the "Adopt" option for now. 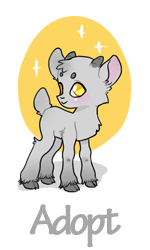 Click "Adopt" to create a new Goatling! (You can go back later to "Rehome" Goatlings other members have surrendered for Sugar Stars.) 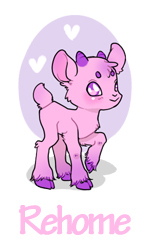 Choose a name and gender for your new Goatling and click "Adopt Goatling". You can change your Goatling's name (for 1,000 Sugar Stars) and gender (for free) later on too. "Hi! Nice to meet you!" Congratulations you now have your first Goatling! Members can adopt up to 15 Goatlings for free. If they have a Crown Account (Diamond Dust item) they can adopt an additional 10 (from 15 to 25). Members can adopt even more Goatlings with Adoption Tickets (Diamond Dust item). You can use special dolls called Appearance Dolls to change your Goatling's look. The doll's appearance will transfer to your goat when used. After use, the magic is depleted and so the doll disappears. If you use another doll on the same Goatling it will replace the previous appearance. Lets update your Goatling's look now! Head to your inventory by clicking "My Stuff" then "My Items". You will find a pack of items to get you started! It may seem a little overwhelming right now but we will explain everything in this guide so you will be an expert in no time! 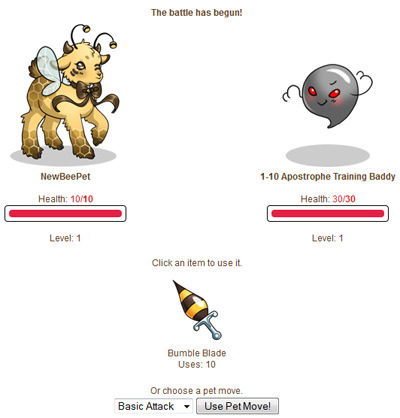 Click the Appearance Doll named "New Bee AD", choose "Change Pet Appearance" in the drop down menu, and click "Use". Choose a Goatling from the drop down menu, click "Select Goatling". Click "ok" on the confirmation popup, and your pet will be transformed! There are over 100 Appearance Dolls to choose from and more are added each month! Click Here to see a full list of Appearance Dolls and how they will change your Goatling's look. Members can get Appearance Dolls in many ways like through shops, events, contests, random events, battles, gifts, and crafting. Next, lets set up your HA buddy! 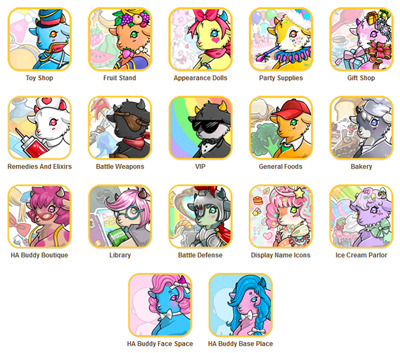 HA Buddies are dress up Avatars displayed on Profiles and Forums. You can choose your own hair, face, clothes, hats, backgrounds, accessories, and bases! Layer items in different ways to create very unique looks. HA Buddys cannot be deleted so if you choose not to have one, or would like to create one later, you can skip this step. To create a HA Buddy, click "My Stuff" then "My HA Buddy". Read the introduction, choose a base, then click "Create HA Buddy". You will be redirected to your HA Buddy Closet. This is where you store your HA Bud items, dress up, and save your outfit! HA Buddy items are not restricted by gender. At first your closet will be empty, but we will fix that right away! Go back your inventory by clicking "My Stuff" then "My Items". You already have 8 HA Buddy items! Click on the "Honeycomb BG", choose "Move To Closet" from the drop down menu, then click "Use". The "Honeycomb BG" is now being stored in your closet! 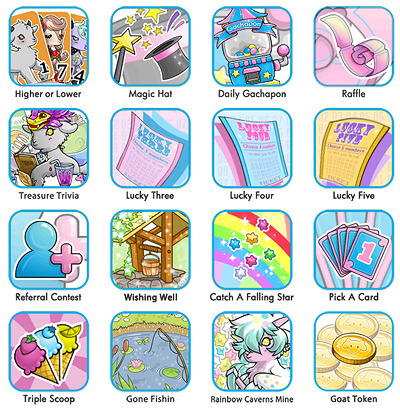 Now click "My Items" to go back to your inventory and move the rest of your HA buddy items into your closet! Honey Face, Bee Wings, Bee Shirt, Bee Hair, Bee Hair 2, Bee Friends, and Bee Head Bopper. Go to your closet by clicking "My Stuff" then "My HA Buddy". HA buddy items are divided into 7 categories. Hair, faces, hats, body, bases, accessories, and backgrounds. Click through the categories to see what you have stored. Click a item to wear, and click the item again to take off. Click "Take Out" to remove the item from your closet - it will go back to your regular inventory. Go ahead and dress your avatar, when you are done click "Save". It is important to refresh the page after saving, or press Ctrl+F5. If you don't refresh the page your changes might not update for you right away. Your HA buddy will now appear above the left navigation menu and you can click on it as an alternative way to get back to your closet. All right! Now you're looking good with your Goatling by your side. You have learned the basics but there are still LOTS of fun things to see and do! Keep reading to learn more! Share some fun facts (or fiction) about yourself, choose a forum font color, and change your display name icon. Crown Account members can change their Display Name colors here too. You can find your Settings by clicking the "My Stuff" then "My Settings". Friendly baddy battles are a big part of some Goatling's day. Would you like to give it a try? Lets prepare your Goatling for a easy Training Battle! Go to your inventory ("My Stuff", then "My Items"). Click the "Bumble Blade", choose "Equip" from the drop down menu and click "Use", make sure the right Goatling is selected, and click "Equip To Goatling". Each Goatling can equip up to 5 attack or defense items. Now head to the Training Center by clicking "Battle" in the left navigation menu then click "Training Center" at the top of the page. The first training challenger is called the Apostrophe Training Baddy. Click the "Start Battle" button to the right of that baddy. Your Goatling can attack with a weapon or Pet Move. Weapons are stronger so it is recommend to mainly use those. However, weapons have limited uses and will disappear once used up. For example, the Bumble Blade can be used 10 times. Click the blade to attack until the battle is over. When the baddy or your Goatling is out of health points the battle will end. At the end of each battle a notice will appear at the top of the page that says: +THE BATTLE IS OVER! CLICK HERE TO FINALIZE AND CLAIM REWARDS!+ It is very important to click this so the battle finalizes and your Goatling receives experience points and loot. Loot is added to your inventory. When your Goatling receives enough experience points it will level up and become stronger. If you click away from this page without clicking the finalizing link you can get back by clicking "Battle" in the left menu, then "My Battle" at the top of the page. Training Center Baddys only reward your Goatling experience points. However, Battle Center baddys give experience, Sugar Stars, and limited edition loot! Visit the Battle Center by clicking "Battle" in the left navigation menu then click "Battle Center" at the top of the page. Make sure the read the information at the top of the Battle Center page. These baddys grow stronger each time they are beat so they become more and more of a challenge over time. Play and feed your Goatling! Every time your Goatling battles they lost a hunger and mood point. You can replenish these by giving your Goatling toys and food. Go to your inventory (My Stuff then My Items) and click the "Goat Bee Plush". The amount of mood points this particular toy gives can be seen in the description. Choose "Play With Pet" from the drop down menu and click "use". Choose a pet from the down menu and then click "Play With Pet". Use the "Jar Of Honey" the same way but choose "Feed To Pet" from the drop down menu. Since your pet was in a battle, chances are it lost some or all of its health points. Use the "Vitamin Bee" health potion on your Goatling to recover! Toys, food, and Health potions, will disappear after being used. The Explore Area is another place where your Goatlings can find loot and battles! Your Goatling can also battle other Goatlings here for a chance to win Appearance Dolls! To visit the Explore Area click "Explore" on the left menu. Currently there are only 4 Areas to explore. Each area has 5 maps with different baddys, Goatlings, and loot. More areas will be added over time. The fee to visit to each area is 1,000 Sugar Stars. Each area can be explored 10 times per visit. To start, simply click any map thumbnail. You can then click anywhere on the enlarged map 10 times to find an event. Events can be a battle challenge, discovering loot, or nothing. Explore baddys are similar to Battle Center Baddys but they are not limited time. It's important to remember the difference between battle opponents so lets recap. Training Center Baddys: Don't get stronger. Permanent but have level requirements. Give experience. Battle Center Baddys: Get stronger after a defeat. Limited time only. Give experience. Drop limited edition loot. Explore Area Baddys: Get stronger after a defeat. Permanent. Give experience. Drop loot. Explore Area Goatlings: Get stronger after a defeat. Permanent. Give experience. Drop loot including Appearance Dolls. Play mini games at the Arcade and win awesome prizes and Sugar Stars! To find the Arcade click "Arcade" in the left menu then choose a game to play. Each game comes with important instructions so read them carefully before playing. Free games that are perfect for beginners are: Daily Gachapon, Catch A Falling Star, Gone Fishin, and Rainbow Caverns Mine. Many more mini games will be added over time. If you click "Shop" on the left menu you'll find yourself in the shopping area. There are two sections here - The Shopping District and Members Ally. The Shopping District are shops run by Goatling Shopkeepers. Each shop stocks specific items and restocks are every 10 minutes. Library - Books for your Goatlings. Books will raise your Goatlings intelligence and disappear after use. The Members Ally are extra shops and services to help members manage items. Members can set up their own shops to sell items to other members for Sugar Stars! Start by going to "My Stuff" then "My Shop" Enter a Shop Name and optional description and click "Create my shop". To stock your shop, first go to your inventory ("My Stuff" then "My Items") and click a item you'd like to sell. 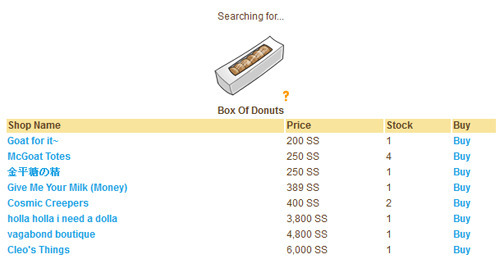 Choose "Move to Shop" in the drop down menu and click "Use". The item will not appear in your shop until you set a price for it. To set a price go back to your shop by clicking "My Stuff" then "My Shop". Prices on items are always changing so you can price check your items by entering the item name in the search box at the bottom of the left menu. This will bring up a list of what that item is priced at in other member shops. (This is also a great way to buy items!) After you've decided on a price, enter it on your Shop Stock page (do not add commas), and click "Update Items". The Diamond Dust Shop sells special services and goods in exchange for Diamond Dust. Diamond Dust can be purchased using PayPal. Once the payment is complete the Diamond Dust will be added to the members account automatically. Diamond Dust items that have been purchased by members can be resold for Sugar Stars to other members. Members are not required to buy Diamond Dust items to play on the site. Crown Account: A Crown Account is a special item that gives your account fun and permanent upgrades. 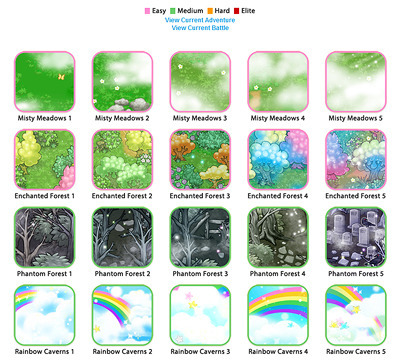 Upgrades include 10 extra pet slots (from 15 to 25), customize their Display Name colors, forum limitations lifted, and gain access the VIP shop. 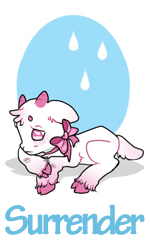 Adoption Ticket: Gives the member an additional pet slot to adopt another Goatling. Name Tag: Allows the member to change their username. + Members who are under 13 cannot use the Forums. The Live Chat can be accessed through the forums. It's a simple chat room that automatically displays your username and makes a small sound when someone posts. Member usernames are in blue and moderators in pink. Members who are 13 and younger cannot use the Live Chat. Goat Mail is a private email system. It can be found by clicking the envelope icon at the top of the page. Members who are 13 and younger cannot use Goat Mail. If a particular member is making another member uncomfortable in any way they can add them to their block list to stop them from interacting with them. The Block List can be found on the Goat Mail inbox page and on the "My Settings" page. Get together with friends and start or join a club. Make friends who share common interests and chat on your clubs own mini forum. Find the Clubhouses by clicking "Town Map" then click the Clubhouse on the map. Or click "Shops" scroll down to the Members Alley and click "Clubhouses". Members who are 13 and younger cannot use Clubs. Here on Goatlings.com members help the site grow through member created designs. Members can submit Goatling designs, Ha Buddy clothes, item art, and even Baddys! All skill levels are welcome! Members who create designs for the site will receive that item for free. Their username will also be displayed in the items description as the original designer! Members can create a thread in the Member Created Designs forum to share their design. If it receives a lot of member support, and is approved by the Goatlings team, it will be added as an official design on the site! Now you know the main points about playing on Goatlings.com! It may seem like a lot to take in at once but members get used to the site very fast. If you have any questions or need to report something you can send in a Support Ticket. Support Tickets act a lot like a private forum for you and Goatlings Staff. Some Tickets will take longer to answer depending on how much research or investigation is required. If you feel like your ticket is taking to long to be answered you can "bump" the ticket by replying to it or by simply typing "bump". Please don't create multiple tickets for the same issue as this will clog our system and make it harder to get yours answered. Support Tickets are confidential and are only viewable by a special group of Support Ticket staff. Members who are under 13 are also able to send Support Tickets.